Click on pictures outlined in blue to obtain larger images, which take longer to download. To return to this page, click on Back at the top of the Netscape screen; to return to the main menu, click on the Ruthidesigns icon. All images copyright Ruth M. Landow of Ruthidesigns. Prices are in US dollars. 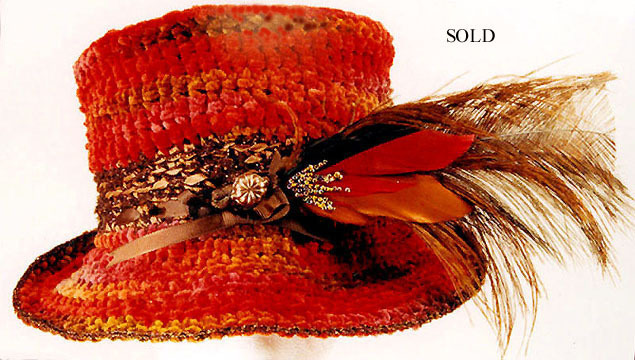 Ruthihats are original, one-of-a-kind, handmade women's head coverings. 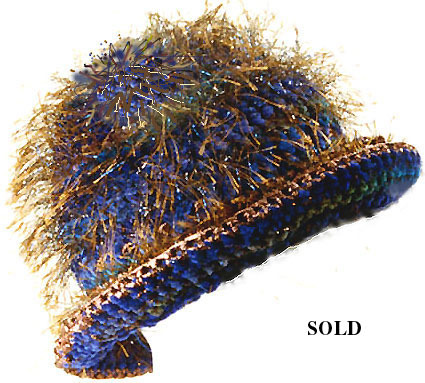 Each hat is knitted and/or crocheted of materials gathered in searches for materials in the USA in New England, Florida, New Mexico, New York, and California as well as abroad in England, Spain, Italy, Holland, and Southeast Asia. Some of these materials are hand dyed, and some yarns are even hand spun. 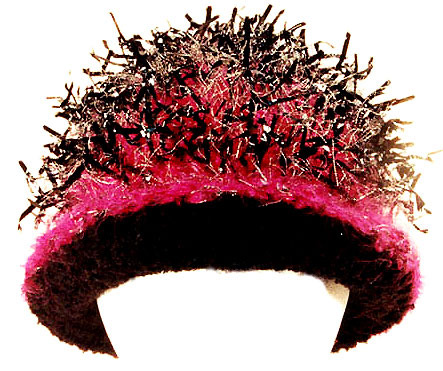 Hat materials include cotton, rayon, or acrylic chenille; mohair, wool, nylon, silk, lurex, cotton ribbon, and rayon raffia; there are also combinations of yarns and some fiber blends. 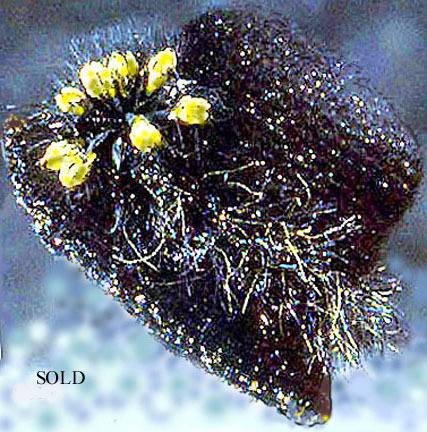 In each piece, a soft, warm, nonscratchy material has been employed for that portion of the hat that touches the ears, neck, or forehead. 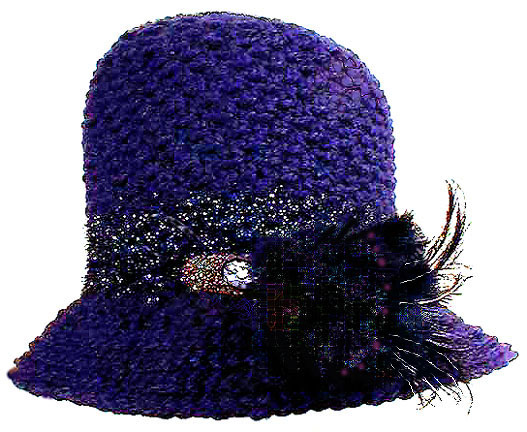 Each hat is ornamented with crocheted or ribbon flowers, ribbon, and wood, plastic, glass, or metal beads and charms. 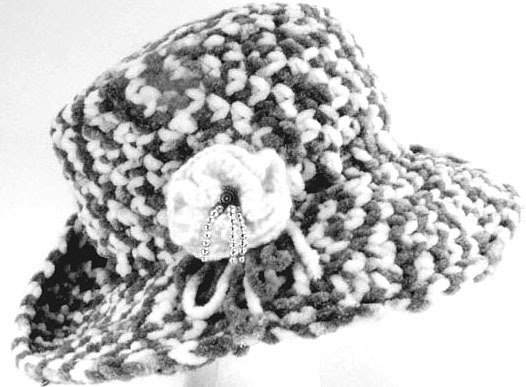 Unless otherwise noted, all hats are sized One Size Fits Most: they are stretchy in construction and adjustable with some kind of drawstring.They are also handwashable as follows: wash gently in cool water (after removing any detachable ornaments); squeeze out excess water by rolling in a clean towel; shape when damp, and air dry.